This summer, the U.S. Midwest is the place to enjoy some of James Tissot’s most popular oil paintings.”Impressionism, Fashion, and Modernity” is at the Art Institute of Chicago from Wednesday, June 26, 2013 through Sunday, September 22, 2013. This blockbuster exhibition includes a Tissot painting from Cleveland as well as Tissot crowd-pleasers from Paris, London, Boston, Los Angeles and Toronto. Click here to read about the Tissot works included. Year around, public collections in Cincinnati, Toledo, Cleveland, Milwaukee and Minneapolis feature other Tissot favorites. Tissot left his home in Nantes, a seaport on the west coast of France, at age 19 in 1855. In Paris, the young artist started out renting a succession of student rooms in the Latin Quarter. With his increasing success, he began a collection of Japanese art and objets, and by late 1867 or early 1868, he moved into a villa he had built on the prestigious avenue de l’Impératrice (now avenue Foch). [Read more about Tissot’s villa here.] His art collection had grown to include a Chinese shrine and hardwood table, along with a model of a Japanese ship, a Japanese black lacquered household altar, and dozens of embroidered silk kimonos, Japanese dolls, folding screens and porcelains. By 1868, his studio, a showcase for his renowned collection of exotic art, became a landmark to see when touring Paris. To read about how Tissot used his studio as a marketing tool to attract commissions, click here. 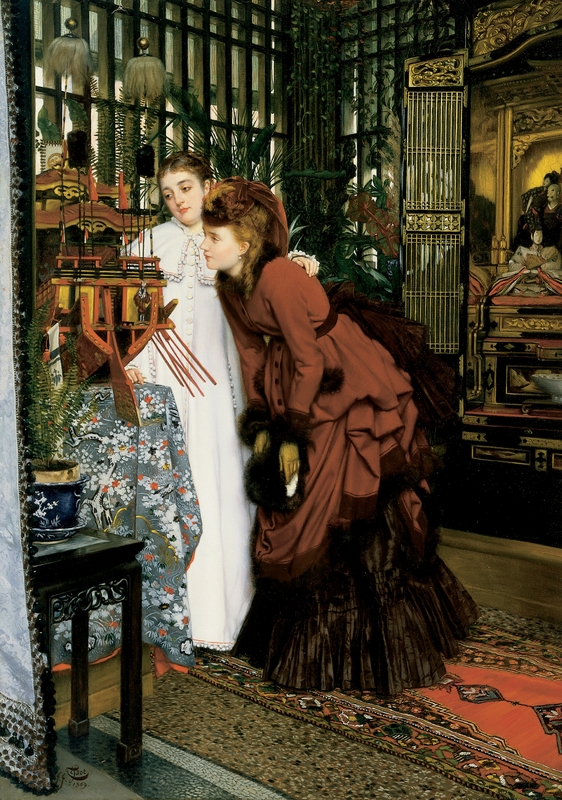 In 1869, Tissot assimilated pieces from his art collection into elegant compositions in three similar paintings featuring young women looking at Japanese objects in his villa’s lavish interiors filled with Oriental carpets, furniture, fabrics, carvings, vases and wall hangings. By the 1930s, the version above was hanging in an interior decorator’s store on Third Street in Cincinnati and was purchased by Dr. Henry M. Goodyear; he and his wife gifted Tissot’s picture to the Cincinnati Art Museum in 1984. James Tissot fled Paris after the Franco-Prussian War and its bloody aftermath, the Commune. [To read about Paris in June, 1871, click here.] 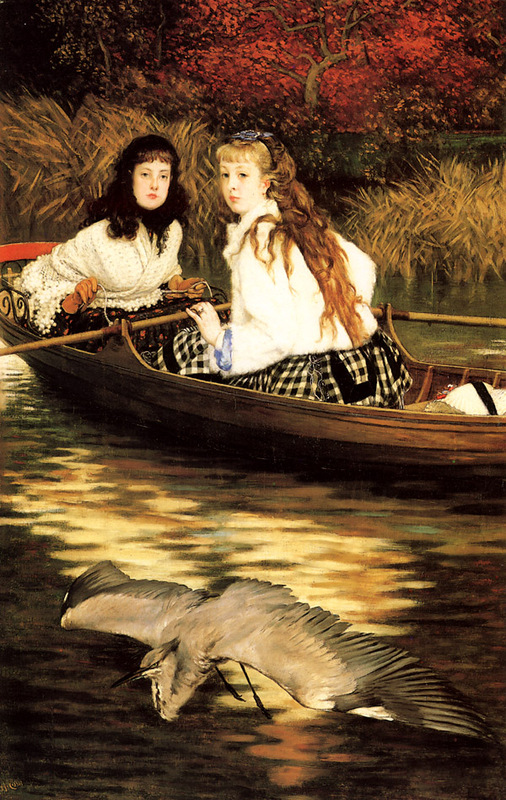 On the Thames, A Heron (c. 1871-1872) is one of Tissot’s first paintings after his arrival in London – and it was the first on record to be sold at auction in England. Calculated to appeal to Victorian tastes, this Japanese-influenced scene was owned by wealthy Spanish banker José de Murrieta. Murrieta tried to sell the painting on May 24, 1873 as On the Thames: the frightened heron; priced at 570 guineas, it did not find a buyer. His brother, Antonio de Murrieta, attempted and failed to sell it on June 15, 1873 for 260 guineas. As The Heron (35 by 23 in./88.90 by 58.42 cm), the painting was sold by Sotheby’s, New York in 1973 for $ 32,000 USD/£ 12,886 GBP. On the Thames, A Heron was the gift of collector Mrs. Patrick Butler, by exchange in 1975, to the Minneapolis Institute of Arts and is displayed in Gallery G357. For an interactive view of it, click here. Tissot exhibited London Visitors (c. 1874) at the Royal Academy in 1874. 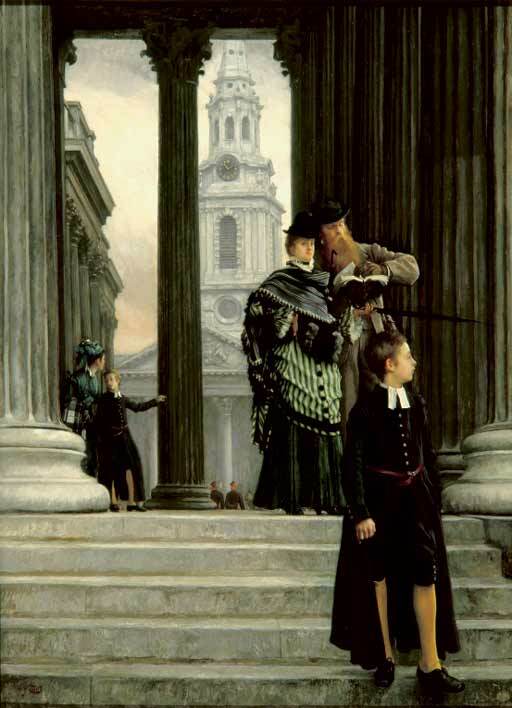 This scene on the portico of London’s National Gallery, with the church of St. Martin-in-the-Fields in the background, was not well received by the critics, one of whom wrote, “London Visitors will not, we fear, add to M. Tissot’s reputation.” This was partly due to Tissot’s foreign take on a familiar London sight – St. Martin-in-the-Fields is not portrayed correctly from the perspective Tissot presents – and partly due to the “immodesty” of the woman looking out at an implied male viewer, who has disposed of his cigar on the steps in the foreground in her presence. Men would have understood the woman to be sexually available, and this was considered “French” rather than English, quite a distasteful picture for Tissot to present to the public. The Times immediately evinced suspicion of the painting, referring to it when the Royal Academy exhibition opened in May, 1874 as “another illustration of the thorough appropriation of English types and subjects by this clever French painter.” “Clever” was not intended as a compliment. In 1951, London Visitors was acquired by the Toledo Museum of Art in Ohio. It was purchased with funds from the Libbey Endowment, the gift of Edward Drummond Libbey (1854 – 1925). Libbey founded the Libbey Glass Company in Toledo in 1888 and the Toledo Museum of Art in 1901. He served as the museum’s president from 1901 to 1925 and bequeathed to it his collection of Dutch and English art. A smaller version of London Visitors is in the collection of the Milwaukee Art Museum, the 1888 gift of Milwaukee meat packer and philanthropist Frederick Layton (1827 – 1919). 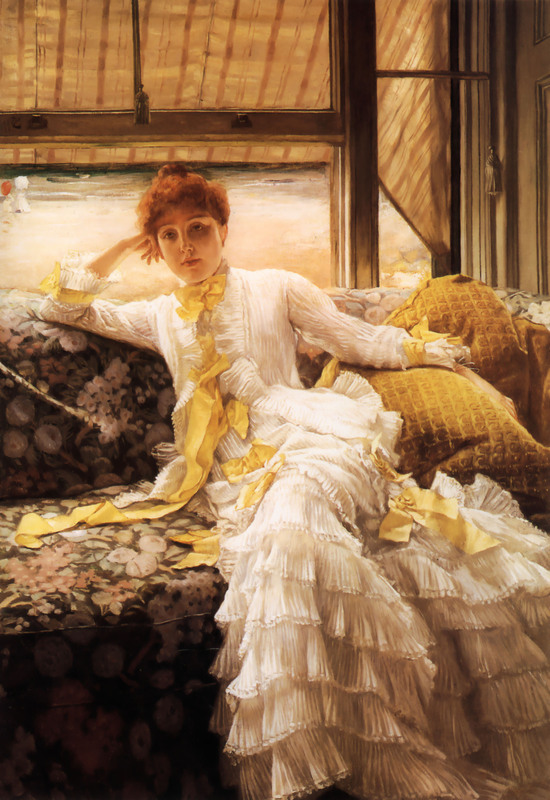 This painting had been sold at Christie’s, London in 1887 for £ 230 and by the same auction house in June, 1888, to the prominent London art dealer Arthur Tooth, for £157 10 s. In this version, also c. 1874, Tissot removed the cigar and shifted the woman’s gaze off to the right [i.e. the viewer’s right], as if to make amends for the offensive original version. 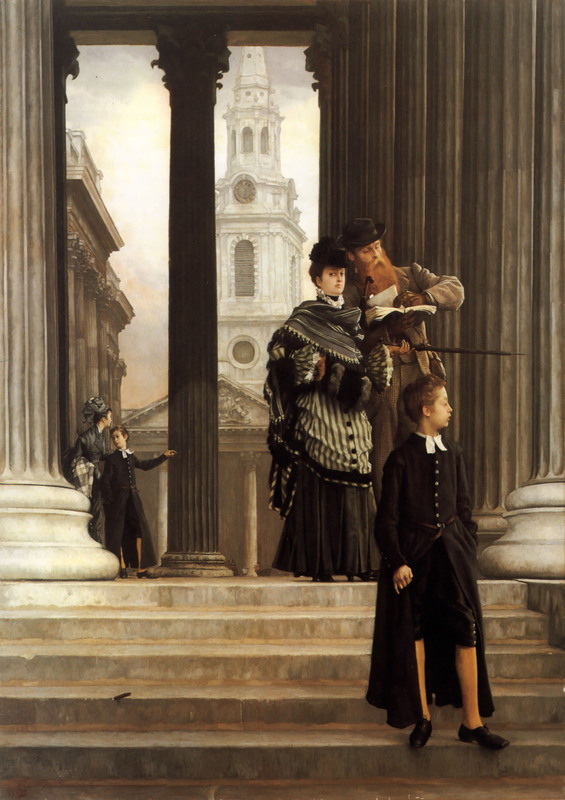 Tissot exhibited July (Speciman of a Portrait), along with nine other paintings, at London’s Grosvenor Gallery – a sumptuous, invitation-only showcase for contemporary art in New Bond Street – in 1878, the year it was painted. The painting is one in a series representing months of the year, and the figure is modeled by Tissot’s mistress and muse, Kathleen Newton (1854 – 1882). 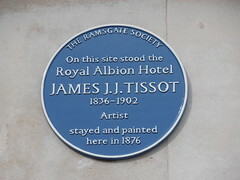 The setting for July was the Royal Albion Hotel near the shore of Viking Bay in Ramsgate, a seaside resort on the Kent coast, seventy-eight miles southeast of London. At some point, another artist painted a frizzy red hairstyle (probably considered more up-to-date) on Kathleen Newton. In 1980, the painting was donated to the Cleveland Museum of Art, Ohio at the bequest of Noah L. Butkin. 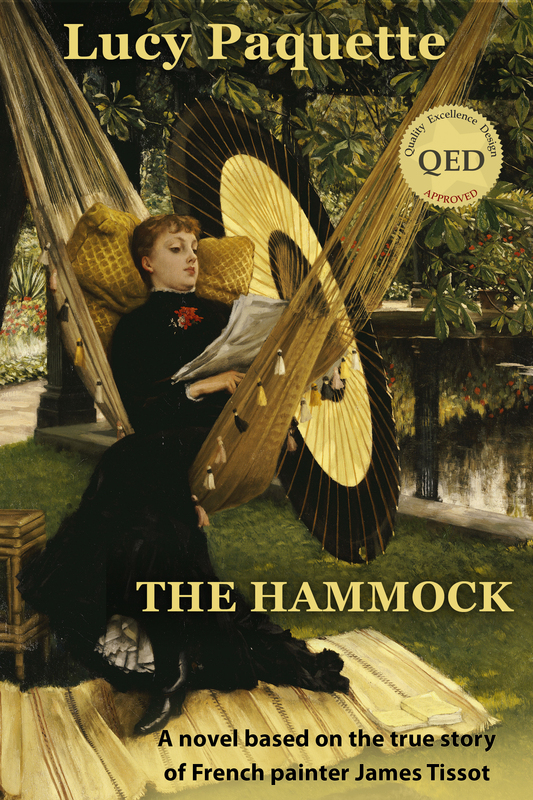 This entry was posted in Art blog, Art History, Impressionists and tagged James Tissot, Kathleen Newton on July 11, 2013 by Lucy Paquette, author of The Hammock: A novel based on the true story of French painter James Tissot.